As pointed out by Gord Lansdell at his Northwest Broadcasters site, the CKNW–Global BC news partnership appears to be expanding. This past week ‘NW began carrying the 5 a.m. 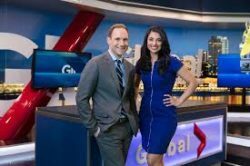 Global News Morning, in addition to already simulcasting the evening 6 p.m. News Hour. I have noticed that even Jill Bennett has been reduced to replaying some of the stuff that has already aired on other shows. News readers create content. Jon McComb has not yet brought the janitor in for an in depth interview about housing. A courier would equate to an expert on transportation /translink. So JM no longer is on air from 530 till 10am. No need for Gord Macdonald to read the 5 am news and ease on into JMs show. Adler gets a spot on the JM show. Squire has a spot on the JM show. If I was JM I would start to watch my back as they could easily rerun the 4 hours of the shift and presto they dump a big salary and a lot of paid av. Maybe Global news at noon can replace the entire NW news department. Even less diversity in our media., thanks Corus/CKNW/Global. This comes a week after NW dropped its major news broadcasts at noon and 5pm. Has CKNW ever covered a news story that contradicts Global’s coverage? Do NW’s reporters and hosts have the guts to take Global on when they get things wrong? Another reason to listen to CBC radio on the way to work in the mornings. With the proviso that the CBC AM signal has been dramatically weakened the past two weeks. How to send listeners to CBC. The Top Dog is now at the bottom of the news ladder. It seems to get worse week by week. Must be difficult to work for CKNW and others when you are always looking over your shoulder. Not much future for a Pudgy 50 year old White Guy that has 25 years experience in Radio News. Somehow that jut does not seem right, it is not fair. Traditional news dissemination(radio, tv, newspaper) is outdated. With so many awesome news apps keeping me up to the second, why would I rely on the aforementioned to give me ‘old’ news. Throw in weak delivery and very questionable newsworthy content, declining audiences and corporations have no choice but to amalgamate, cut staff and/or hire a cheap newbie in an effort to stay afloat. When was the last time you heard the plea ‘BC is suffering a severe shortage of media people’. Never, not once, ever. As someone once told me, it’s a job for lazy people, of which there is never a shortage. That’s why there are, what you describe as 50 year old pudgy guys hanging on. Don’t see too many pudgy carpenters or iron workers, the two most in-demand professions in BC, as reported recently by those pudgy, white guys. I appreciate what you point out but it seems to me that NW has seemed to be “Dumbing Down” Radio over the past few years. Even simple pronunciations seem to stump far too many News Readers at that Station. Yes times are tough and there are many options for Listeners but as I have stated on PSR in the past there are still thousands and thousands of Listeners over Say 40 thst have Money to Spend with NW Advertisers and those Listeners still get their News and talk from Radio. Time and time again when NW come up on this Blog Traditional NW Listeners “Beg “ for NW to go back to what works. Let’s face it younger types do not get anything from Radio, why would NW not go where the listeners are? NW Listeners former and current do not necessarily want Conservative Radio they want ?Balance and I believe that would work. Listeners also want News Readers that can also pronounce Saskatoon and sometimes a seasoned veteran with Broadcast Knowledge along with an understanding of News might be important. It is fine to save money I strive to do that every day in my business but I would never think of dismissing experienced, skilled, and battle proven professionals just to improve the bottom line. I suppose NW Execs in Toronto will monitor the results of what the PD is doing as of late and they will then make decisions based on those results. ‘NW should lose their morning helicopter traffic reports…totally white noise, sounds like it’s The Jupiter Traffic Report. P.S. Hey ‘NW, wanna save $$$? Don’t do airborne traffic reports on holidays when there are NO rush hrs. BTW: who the hell listens to the simulcasts anyway? Remember: ‘NW is on the Radio Dial, not TV…. BMCQ raises a lot of good points. The only thing I would shade differently would be to say the execs in Toronto won’t be monitoring the results of local decisions because the decisions originated in Toronto. Therein lies a lot of the problem. I am not a Radio, TV, or Print Guy, I run a Business that Manufactures and Exports Non Ferrous Metal Products World Wide. That is not easy to do when based in YVR but we are very successful mainly because of the people that work in the Unionized Company. We have a lot in the way of CNC Technology and other Technological Assists but the Company would be nothing without the hard working Employees and I am respectful and thankful for that every day. I really struggle with much of how TV, Radio, and Print seem to consider their most precious commodity their Talented Seasoned Employees as disposable. Yes Bottom Line is important but with the so many problems and mistakes we witness every day there should be more appreciation of experience, professionalism, maturity, and steadfastness. Of course Younger less experienced talent deserve their chance but that chance should not be offered because the outlet is attempting to save a few bucks. What does that really say about quality? Or do they even care? Sometimes I wonder why more Advertisers do not take a more pro active roll and voice concerns about substandard Broadcasting with media outlets they choose to promote their products. Paul Haysom. A solid news reader. See that he’s also handling the noon news. Brad: Paul Haysom, who’s dad ran the Global Newsroom for a time, did his penance in Edmonton and now fills a critical slot in Burnaby. I think what your seeing is not him being full of himself but just being happy with his current position. It will likely fade with time and you won’t notice it anymore. BMCQ: Advertisers won’t rebel against young, inexperienced announcers because many of them want to voice their own commercials in spite of not having the pipes or experience to do it properly. You are however, correct about owners cutting from the top and negating experienced gathered by those senior employees. Actually Terry, Paul, like all west coast boys should all have to put in at least one year in Alberta winters, Paul did a few more than that, working in Calgary, not Edmonton at Global TV. To Brad or any others sharing that opinion, that is certainly not the case of Paul being wrapped up in himself. Having met him and a co-partner at the time, over coffee probably 10 years ago in Victoria when he was doing sports on CHEK TV. I found him to be an honest, straight up, nice guy. I knew he was Ian’s son, but I also knew Paul was his own man, without a doubt inheriting his dads skills and talent. Paul has paid his dues, and I was so pleased to see him return to the coast and Global tv Congratulations Paul! You would think that of the 3 forms of news media prior to the www radio should and could survive. News papers can not compete for obvious time lapse reasons. TV also cant be spontaneous. Radio (as long as its locally controlled can be almost as fast as the www. All it takes is the will to make it happen. Paul Haysom is a nice guy but he has developed some bad habits on air. The commenters all make some great points. Here’s a slightly different perspective. We have been travelling in West Africa and enjoyed tuning in lo CKNW at 12 noon there (5 a.m. In Vancouver) to get a very full report of the morning’s news and weather – in much more detail than offered in a five-minute newscast. It was a good way to keep up with all that has been going on back home.